Tropical Storm Nock-ten (Bagyong Nina) is now moving away from the Philippines after leaving a trail of destruction in the islands. 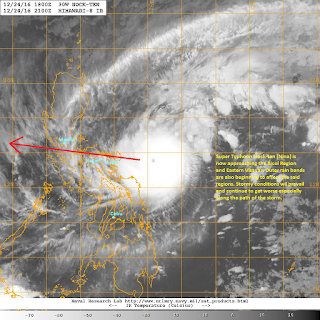 The storm center was last located approximately 500km west of Manila. Maximum sustained winds have decreased to 110kph with gusts of up to 140kph. TS Nock-ten is currently moving west northwestward at 20kph. All Public Storm Warning Signals in the Philippines have been dropped by PAGASA. At least 6 people are confirmed dead in the Philippines due to the typhoon. Furthermore, 3 provinces have been placed under a State of Calamity due to the widespread damage brought by Nina (Catanduanes, Camarines Sur, and Albay). Latest satellite image shows convective activity is still going strong as Tropical Storm Nock-ten moves across the South China Sea (West Philippine Sea). However, the core definitely took a hit as it crossed the Philippine Islands yesterday. We expect continued weakening from here on out due to cold air surge from North Asia, as well as increasing wind shear in the region. 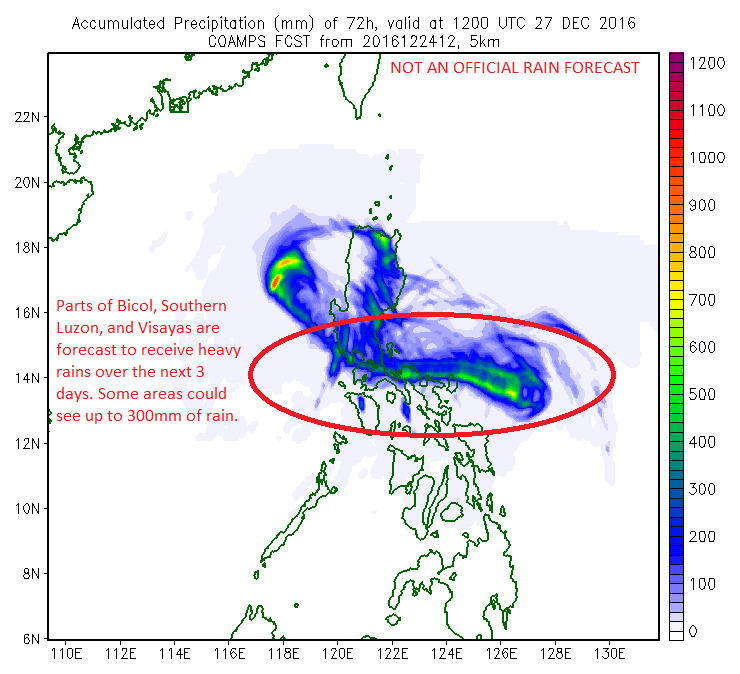 Nock-ten (Nina) should exit the Philippine Area of Responsibility with the country having much improved weather over the next few days. Nock-ten (Bagyong Nina) has slightly weakened after making landfall in the island-province of Catanduanes early last night. 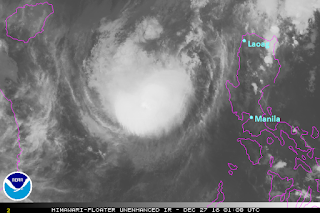 The core is currently traversing the island of Marinduque with the center being last located approximately 100km east southeast of Batangas City or about 170km southeast of Manila. Maximum sustained winds have slightly decreased to 185kph with gusts of up to 230kph. Typhoon Nock-ten is currently moving westward at 20kph. As of 5am this morning, PAGASA has issued Public Storm Warning Signal #3 for Camarines Sur, Southern Quezon, Marinduque, Batangas, Northern Oriental Mindoro, Lubang Island, Cavite, and Laguna. Signal #2 for Metro Manila, Rizal, Northern Quezon, Polilio Island, Bulacan, Bataan, Pampanga, Southern Zambales, Southern Oriental Mindoro, Romblon, Northern Occidental Mindoro, Burias Island, Camarines Norte, and Albay. Signal #1 for rest of Occidental Mindoro, Ticao Island, rest of Zambales, Tarlac, Nueva Ecija, Southern Aurora, Pangasinan, Sorsogon, and Catanduanes. The pinhole eye that was visible yesterday has become cloud filled, indicative of weakening, as Typhoon Nock-ten (Bagyong Nina) traverses the terrain of Southern Luzon and Bicol areas. Nevertheless, the winds near the core are still estimated to be around 160kph or higher; enough to cause significant damage to properties. We should see continued weakening throughout the day due to land interaction but dangerous stormy conditions will still persist for much of the areas along Nock-ten's projected path. 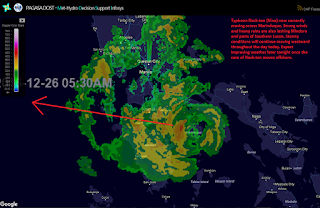 Latest radar image out of Tagaytay station shows the center of Bagyong Nina moving through the island of Marinduque. Rain bands associated with the storm are also affecting large areas in Southern Luzon including Batangas, Laguna, and Quezon; as well as the island of Mindoro. Many areas in Bicol have reported rainfall accumulations of anywhere from 50mm to as much as 150mm. Expect the same rainfall amounts for areas west. 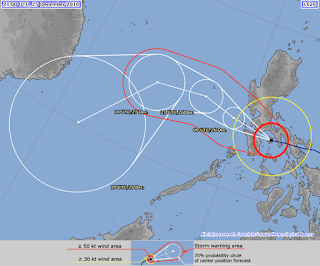 Latest forecast track from the Japan Meteorological Agency shows Typhoon Nock-ten moving generally westward. The center of the typhoon should move very close to the city of Batangas in about 3 hours bringing dangerous strong winds, heavy rains, and high waves to the port city. The island of Mindoro will also be heavily impacted later this morning as the center passes just north of the area. The rest of Southern Luzon, including Metro Manila, should still expect tropical storm-force winds of up to 100kph along with occasional bouts of moderate to heavy rains capable of causing urban flooding. 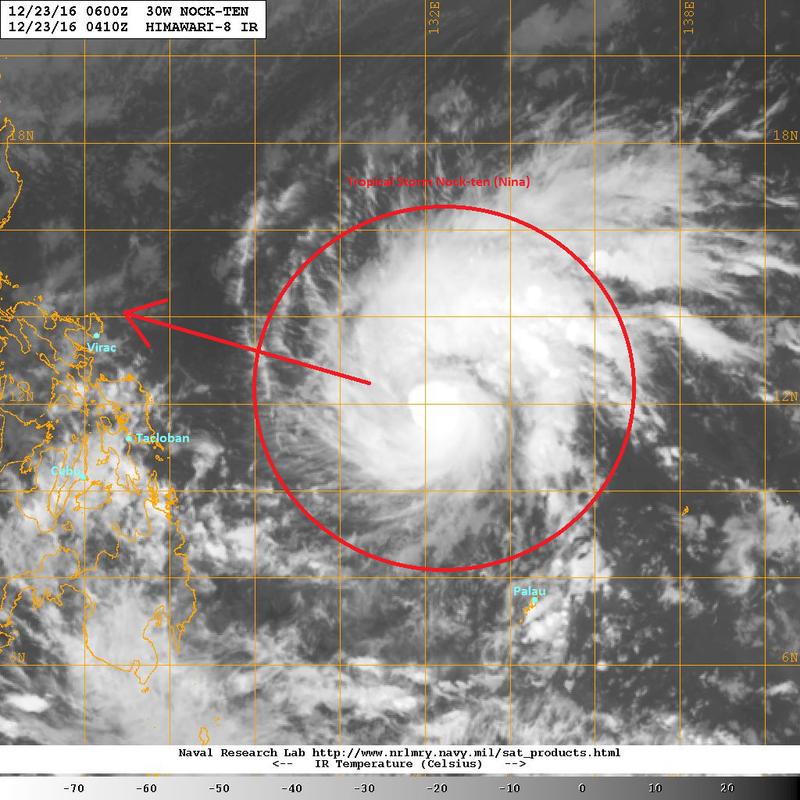 Nock-ten should begin to move into the South China Sea (West Philippine Sea) later this evening. Stormy conditions will likely persist across the western portions of Luzon through the evening hours. Most areas impacted by Nock-ten should see gradual improvement in the weather early tomorrow morning. 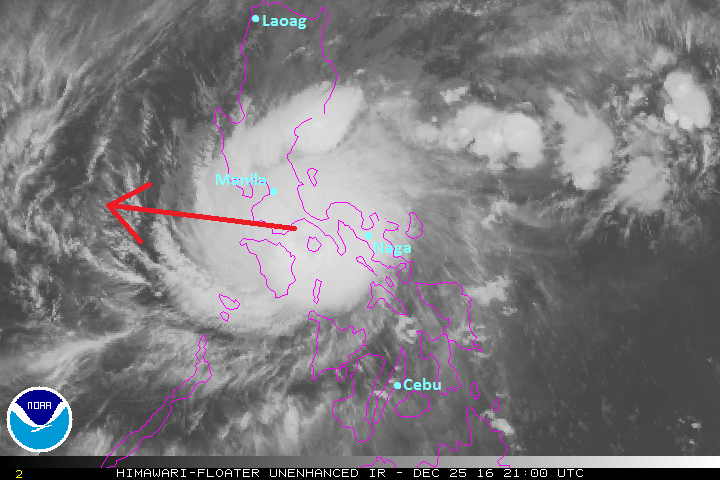 Super Typhoon Nock-ten (Bagyong Nina) is now bearing down towards the Philippine Islands on this Christmas Day. The eye of Nock-ten was last located approximately 200km east of Virac, Catanduanes or about 560km east southeast of Manila. Maximum sustained winds are at 240kph with gusts of up to 295kph. STY Nock-ten is currently moving westward at 15kph. As of 5am this morning, PAGASA has raised Public Storm Warning Signal #3 for Catanduanes, Albay, and Camarines Sur. Signal #2 for Southern Quezon, Marinduque, Camarines Norte, Masbate, Ticao Island, Burias Island, Sorsogon, and Northern Samar. Signal #1 for Metro Manila, Batangas, Nueva Ecija, Southern Nueva Vizcaya, Southern Quirino, Zambales, Pampanga, Tarlac, Bulacan, Cavite, Laguna, Batangas, Rizal, rest of Quezon, Polilio Island, Aurora, Romblon, Occidental Mindoro, Oriental Mindoro, Lubang Island, Aklan, Capiz, Samar, Eastern Samar, Biliran, Leyte, and Bantayan Island. Latest satellite image shows the pinhole eye of Super Typhoon Nock-ten surrounded by deep convective activity. The storm underwent a period of rapid intensification over the past 48 hours as it moved across the Philippine Sea. It will likely maintain this intensity as it makes landfall in Bicol later today. 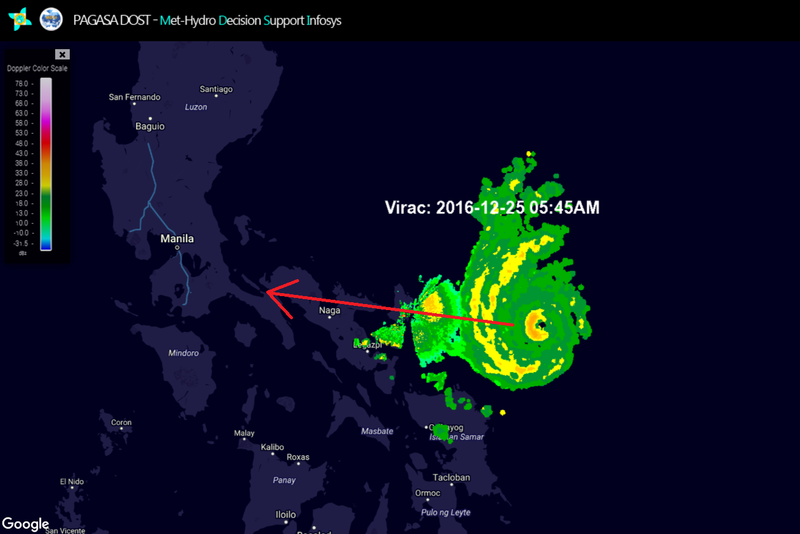 Latest radar image from Virac, Catanduanes shows the eye of Nock-ten (Bagyong Nina) along with its rain bands approaching the Bicol Region and parts of Samar. Rain will continue to spread inland, along with gusty winds. Conditions will only worsen as the day goes by. The image above is one of the many computer model depictions with 3-day rainfall accumulations. We're expecting heavy rains to be observed across much of Bicol and Southern Luzon, as well as parts of Visayas. Some areas (highlighted above) could see as much as 300mm of rainfall over the next few days. 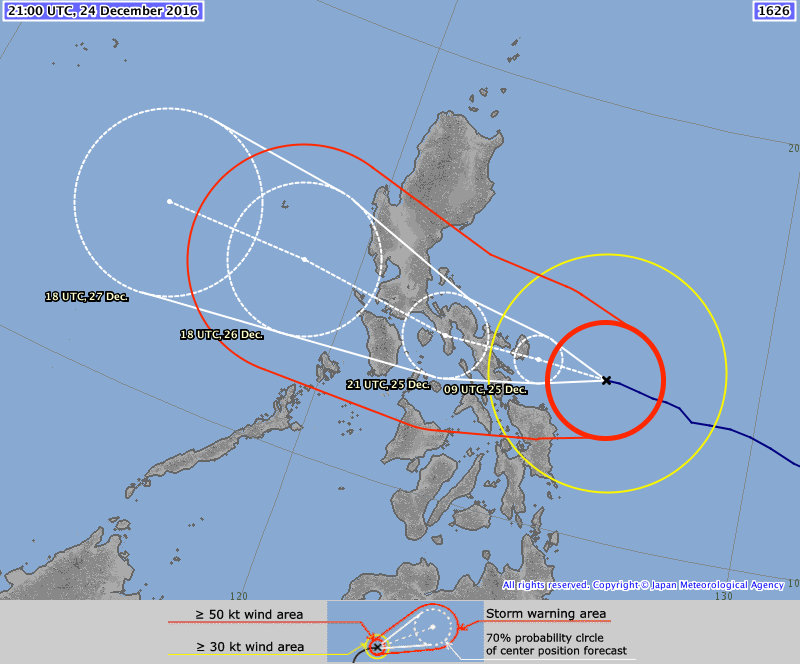 Super Typhoon Nock-ten will make landfall in the island of Catanduanes later this afternoon. Winds of up to 260kph are possible, especially near the core of the typhoon. Winds will weaken further inland but will still be capable of causing destruction to properties. Nock-ten is, then, forecast to continue moving generally westward into Southern Luzon, passing just south of Manila by early tomorrow morning (Monday). By this time, we expect Nock-ten to weaken to lower-category typhoon but will still pose a significant threat for the metropolitan region. Nock-ten will emerge into the South China Sea (West Philippine Sea), as a much weakened cyclone, by late Monday evening. 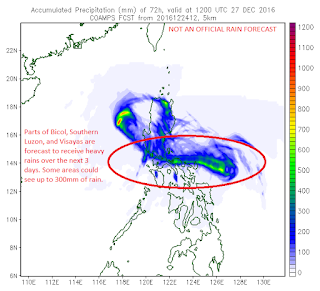 Stormy conditions will likely persist across the western seaboard of Luzon during this time. Improving weather is expected by Tuesday morning across the entire area. 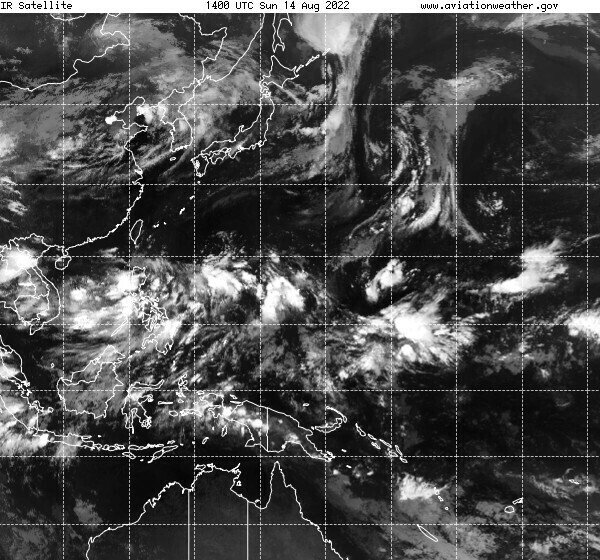 The image above is taken from the Japan Meteorological Agency. The track is in pretty good agreement with other weather agencies in the region (i.e. PAGASA, JTWC). A Christmas-Day cyclone is threatening the Philippine Islands and could even intensify into a typhoon before landfall. Tropical Storm Nock-ten (Bagyong Nina) is currently moving across the Philippine Sea and was last located approximately 620km east northeast of Tacloban, Leyte. Maximum sustained winds have increased to 100kph with gusts of up to 130kph. TS Nock-ten is moving west northwestward at 25kph. 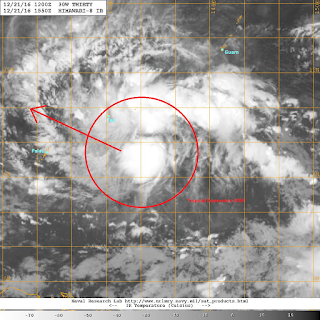 Latest satellite image shows Tropical Storm Nock-ten becoming much better organized this morning. A central dense overcast has developed along with good poleward outflow. Environmental conditions have improved as well and will likely result in further intensification for Nock-ten in the next 24 to 48 hours. Depending on the rate of intensification, Nock-ten may become a typhoon later this evening, and possibly peak as a Category 3 Typhoon before coming ashore in the Philippines. Computer models and numerous forecast agencies are in excellent agreement over the track of Tropical Storm Nock-ten. 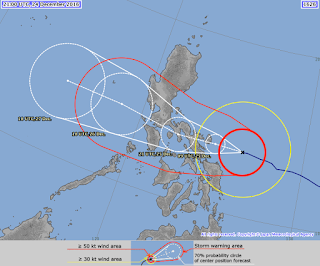 The map above shows the forecast track from the Joint Typhoon Warning Center showing Nock-ten (Bagyong Nina) moving in a west northwesterly direction. A landfall somewhere in the Bicol Region is possibly by Sunday morning (Christmas Day). However, impacts will be felt as far south as Eastern and Central Visayas; and as far north as Southern and Central Luzon. 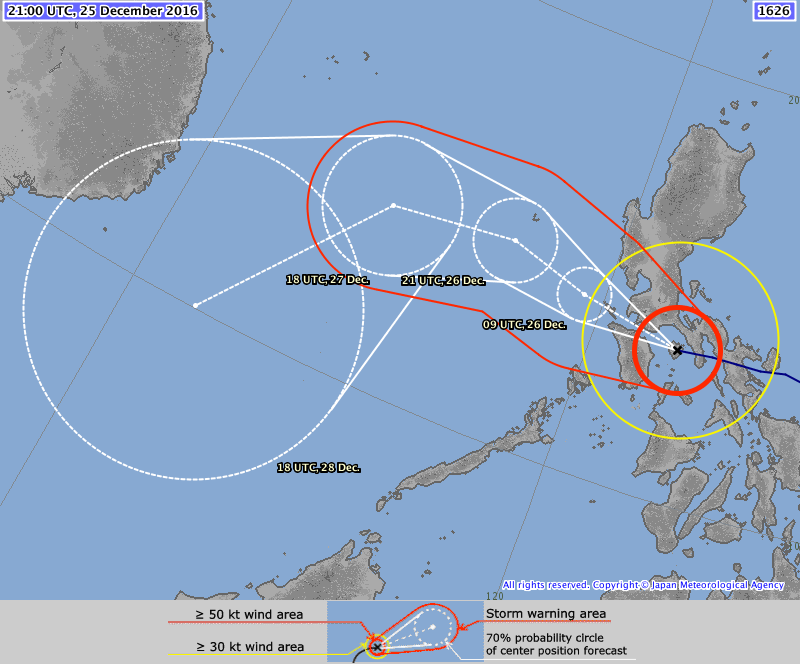 Metro Manila and nearby areas may also see typhoon-force conditions Sunday into Monday. Due to the timing of the impacts, Nock-ten is a potentially dangerous storm and should be seriously monitored in the coming days. If you are in the projected path of the storm, please consider starting any preparations today and tomorrow. The 2016 Typhoon Season is coming to a close but the tropics may be giving us one more storm to track. A Tropical Depression has formed in the Western Pacific Ocean tonight and may pose a threat to the Philippine Islands this Christmas. Tropical Depression 30W was last located approximately 380km southeast of Yap or about 680km east of Palau. Maximum sustained winds are at 55kph with gusts of up to 75kph. TD 30W is currently moving west northwestward at 15kph. 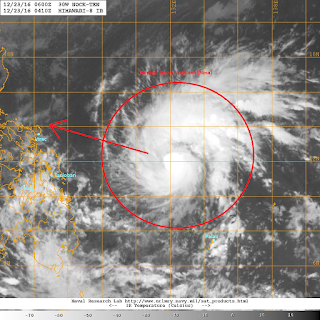 Latest satellite image shows convection continuing to slowly build over the low-level circulation center. 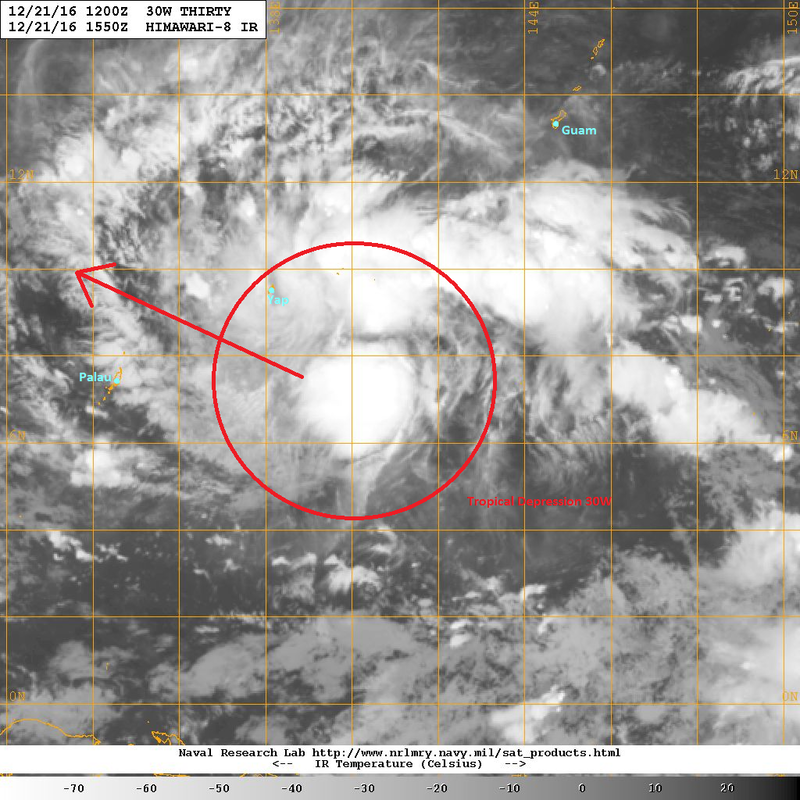 Convective activity ahead of the circulation is also beginning to move into Yap this evening. Rain and gusty winds will prevail in that area, together with Palau, for the next 24 hours. TD 30W is located in an area of marginally favorable environment and we should see the system slowly develop in the coming days. Tropical Depression 30W will continue moving generally west northwestward under the influence of the subtropical ridge. Numerous computer models are in generally good agreement with bringing TD 30W towards the Philippine Islands as early as Saturday morning (December 24). 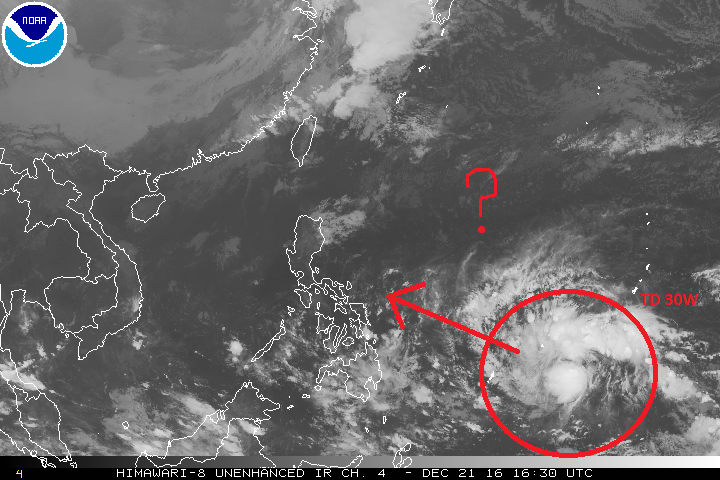 However, the said models still vary as to how strong TD 30W when it does impact the Philippines. While it is still too early to tell exactly which areas will be directly impacted by TD 30W, we urge everyone especially across Eastern Visayas and Southern Luzon to closely monitor the developments of this tropical system.